PSYCHICS AROUND THE WORLD UNITE. WE TOO CAN MAKE A DIFFERENCE IN THIS WORLD! Contact only reliable independent professional psychics who provide top quality psychic readings. What our Psychic Directory Stands For. 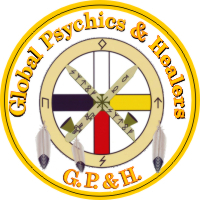 Only the very best psychics in America are invited to be listed in this psychic directory. This psychic directory is solely to promote psychics who offer ethical quality psychic readings. "Remember this Psychic Directory is Unique, it is all about Quality not Quantity." Less than 5% of the psychics who request membership are actually invited to join. This psychic directory is about bringing together America's most enlightened light workers who offer a reliable quality psychic service. We do not list 1-800 or 1-900 hotline psychics or psychics that provide web cam readings or charge by the minute or offer any type of spell work or anything we feel is unethical. We require that our members have their own personal web site and clearly show their fees, photo and contact details. Each psychic is totally independent and sets their own fees. Expect members charge minimum $65 a half hr and can go up to $300 and hr. Please note all psychic readings are by appointment. A psychic reading is generally much more effective and cheaper than traditional counseling sessions and can remain anonymous if you wish. Some of our members are well traveled and may be listed under more than one state or category however all our psychics offer psychic readings in person or by telephone, therefore you have greater options by looking at more than your own state. American Association of Psychics Directory - Mediums - Intuitive - Only the very best Psychics, Mediums, Astrologers, Numerologists, Spiritual Coaches are invited to be listed and be a part of this prestigious organization. USAs top directory of independent professional psychics & mediums. Created by Scotland's own Rosemary The Celtic Lady - Light Worker, Spirit Talks, Author and founder of the American Association of Psychics. World renowned Psychic Medium Rosemary brings to you her gift of communication with the other side to help you with your life path choices. Rosemary Is the Founder of the American, Canadian, & UK Associations of Psychics & Healers. She is an Ambassador For Peace With The Universal Peace Federation, Author Motivational Speaker & Medical Intuitive. It is her goal to bring together credible & ethical Intuitive's and healers from all over the world under one umbrella. All who meet this young woman report profound changes in their lives.